Next week on September 12th some extremely important prizes are about to be awarded that will undoubtedly rock the scientific community. 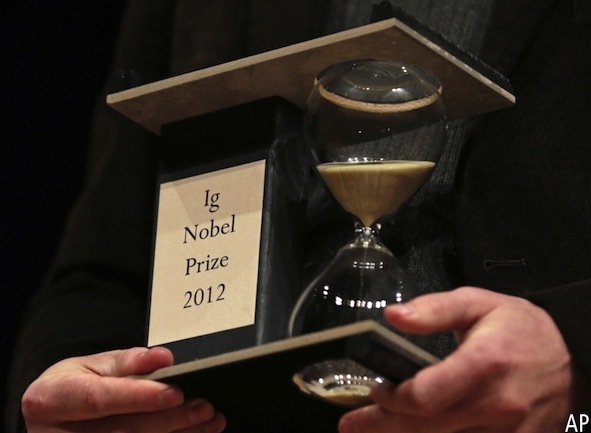 Yes indeed, it’s that time again: the annual Ig Nobel prize award ceremony. I first met the Igs about 15 years ago when I went to a conference in Seattle (yes I’m that old). The talk was a popular one, the Igs being a bit of light relief from all the serious science being discussed. That year there were awards for the development of a suit of armor impervious to grizzly bears, a study on the relationship between height, foot size and penile length (admit it, you’ve always wanted to know) and Jacques Benveniste of France, for his homeopathic ‘discovery’ that not only does water have memory, but that the information can be transmitted over telephone lines and the Internet (hmm). So what are they, exactly? Some describe them as parodies of the official Nobel prizes. Home of the Igs AIR, the Annals of Improbable Research, describes them as awards for research that makes people laugh, and then think. Sometimes, as in the case of Benveniste, an Ig is awarded to someone for their, shall we say, excessively creative application of scientific ideas. More often these days they are awarded to scientists who’ve worked on something rather weird and wonderful, but which actually turns out to have some interesting applications. So, since this is a chemistry blog, what have the last few Ig Nobel Chemistry prizes been awarded for? 2012: Johan Pettersson, for solving the puzzle of why, in certain houses in the town of Anderslöv, Sweden, people’s hair turned green. A great story, this: Several formerly blonde inhabitants of Anderslöv in southern Sweden suddenly acquired new green hairdos. Initially suspicion fell to the water supply, specifically copper contamination, since copper is known to dye hair green. But the problem was only affecting certain households. Testing revealed that copper levels were normal in the water supply itself, however when the water sat in the pipes in some recently-built houses overnight the copper levels rocketed. Why? Copper pipes in the new houses weren’t coated on the inside, so copper was leaching into the water. Residents who’d rather not have green hair have been told to wash their hair in cold water. 2011: Makoto Imai, Naoki Urushihata, Hideki Tanemura, Yukinobu Tajima, Hideaki Goto, Koichiro Mizoguchi and Junichi Murakami, for determining the ideal density of airborne wasabi to awaken sleeping people in case of a fire or other emergency, and for applying this knowledge to invent the wasabi alarm. In this case the title says it all. As anyone that’s ever eaten a lump of that green stuff that comes with sushi knows, if wasabi gets into your nasal passages you know about it. The researchers worked out exactly how much wasabi would need to be in the air for it to be intolerable, and then developed and patented an alarm system that releases that concentration of wasabi in case of emergency. Well, at least it won’t wake up the neighbours. 2010: Eric Adams, Scott Socolofsky, Stephen Masutani, and BP, for disproving the old belief that oil and water don’t mix. A silly title with a serious motive, oil spills being something of a big deal. A team of scientists conducted controlled discharges of oil and water in the Norwegian sea at a depth of 844 meters and demonstrated that most oil from a spill in the deep ocean would in fact mix with water, rather than rise directly to the surface. The decision to award the prize jointly to BP, given the recent Deepwater Horizon incident, was particularly cutting. 2009: Javier Morales, Miguel Apátiga, and Victor M. Castaño, for creating diamonds from liquid — specifically from tequila. This might just be my favourite. It sounds ridiculous, and yet they published a serious paper. Scientists have long used various solvent mixtures to grow thin diamond films, and the researchers in this case were experimenting with mixtures of ethanol (‘drinking’ alcohol) and water. They noticed that the mixture that produced the best results had a similar composition to tequila, and so decided to experiment with the alcoholic beverage. It turned out that some types of tequila really did have exactly the right mixture of carbon, hydrogen and oxygen to promote growth of the films. 2008: Sharee A. Umpierre, Joseph A. Hill, Deborah J. Anderson and Harvard Medical School, for discovering that Coca-Cola is an effective spermicide, and to Chuang-Ye Hong, C.C. Shieh, P. Wu, and B.N. Chiang for discovering that it is not. The mind boggles, doesn’t it? There are many myths associated with pregnancy, and what does and doesn’t prevent it. No one would seriously recommend Coca-Cola as a contraceptive. However the first set of researchers decided to look into the question in a little more depth. They tested small samples of sperm with different types of Coca-Cola and found that they did, indeed, kill some sperm. However their results couldn’t be reproduced by the second set of scientists, who concluded that if Coke did have a spermicidal effect it was weak – little different to their control sample. A Coca-Cola spokesperson responded that “we do not promote any of our products for any medical use”. Glad they cleared that up. This entry was posted in Awards, Chemistry in the media, Chemists and tagged AIR, annals of improbable research, chemistry, ig nobel, Ig Nobel Prize, Jacques Benveniste, NobelPrize, September 12th by katlday. Bookmark the permalink.